U.S. military officials visited an area controlled by the PKK terrorist group's Syrian offshoot the People's Protection Units (YPG) after Turkish airplanes carried out airstrikes in the region, and were seen walking side by side with YPG militants. Images showing U.S. officials with YPG militants in the area of Mount Karachok near the town of Malikiya in Syria on Tuesday was released by Reuters. The Turkish military carried out airstrikes on PKK and affiliate groups' positions in northern Iraq and in northeastern Syria on Tuesday, in order to prevent militants from smuggling fighters and weapons into Turkey, causing at least 18 casualties among the militants. The U.S. military arrived in the Mount Karachok region by helicopter to inspect the site and the impact of Turkish airstrikes in the area together with YPG militants. 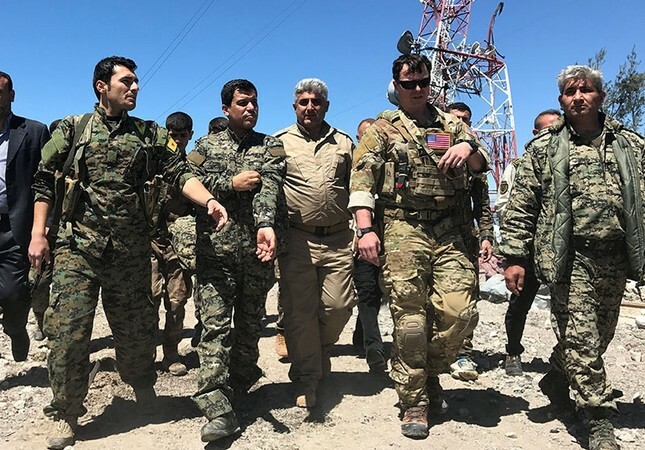 Photographs showed U.S. officials side by side with YPG representatives in the region close to the Syrian-Iraqi border, with a U.S. commander leading the group. Banners showing the jailed leader of the PKK terrorist group, Abdullah Öcalan, can also be seen in the images. In response to a question about how the U.S. reacts to the strikes in Derik and Sinjar, a CENTCOM press desk official said that the Coalition is aware of them and added that it is important for Iraq's neighbors to respect the country's sovereignty and territorial integrity. "We encourage all forces to remain focused on the greatest threat to regional and worldwide peace and security and concentrate their efforts on ISIS and not toward objectives that may cause the Coalition to divert energy and resources away from the defeat of ISIS in Iraq and Syria," the official said, using an alternative acronym for Daesh terrorist group.